Durham secured their second successive victory with a crushing 309-run win over Sussex to reignite hopes of retaining their Championship title. Needing one wicket on the final day, Chris Rushworth had Lewis Hatchett caught at slip by Gordon Muchall as Sussex's second innings ended on 182. On-loan James Tredwell finished unbeaten on 50. 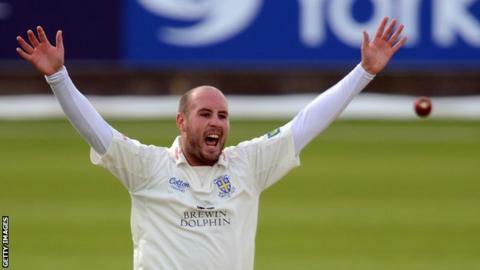 Durham move up to fourth place, 29 points behind current leaders Yorkshire with a game in hand. For Sussex, it was their fifth loss against Durham at Chester-le-Street since 2005, and their third defeat of the season. Having claimed two wins from their first two matches, the visitors have failed to win any of their next eight, leaving them two points above the relegation places. "We are in a relegation battle, but there are so few teams in the division you are nearly always battling neat the top or bottom. "We conceded too many runs in the first innings here after having them 148-5." "This was as comprehensive a win as you could get. From the batsmen through to the bowlers it was a real team effort and for the second year in a row Sussex were blown away here. "Two wins on the bounce have propelled Durham up to fourth, hot on the heels of the leading pack and with a mouth-watering match to come against Yorkshire in Leeds soon. They are proving hard to beat too. "It's a shame they could not have won this on the final night. But it took just 10 minutes and 17 balls to get the last wicket today and there were at least 75 spectators here to see it. Well done them."